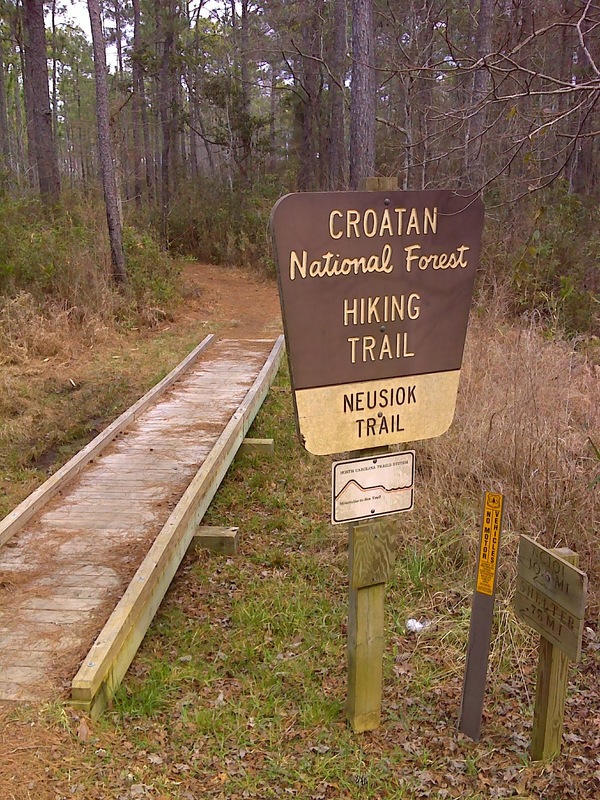 Built and maintained by volunteers from the Carteret County Wildlife Club with the help of the US Forest Service, the Neusiok Trail is a footpath that emulates the venerable Appalachian Trail (AT). Its well-marked route has undergone constant maintenance and upgrading since its inception in the early 1970's. 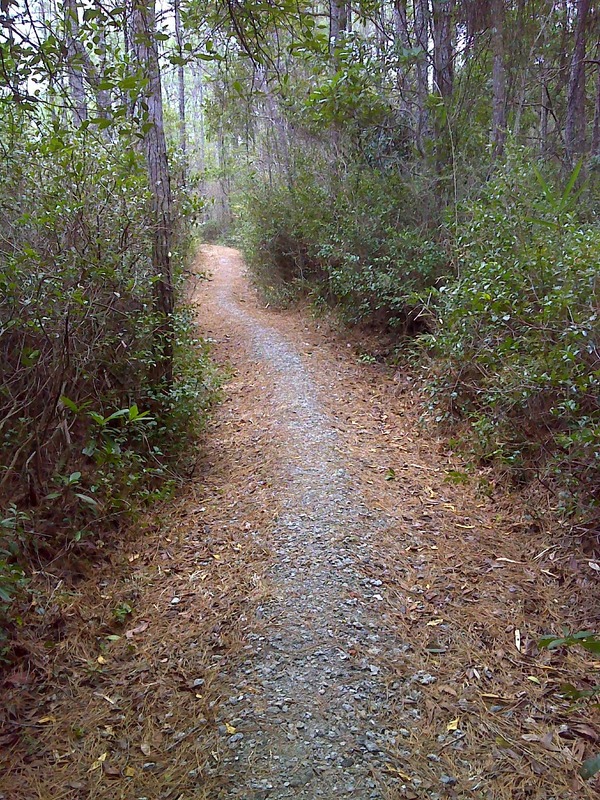 There are miles of boardwalk, gravel has been laid on other boggy sections, the entire trail is well marked with the same 2" white circles that the Mountains-to-Sea uses, and it is immaculately clear and weed free to a width of four feet (much better than the AT in many places in New England). The former route of the Mountains-to-Sea Trail followed the entire 20.7 miles of the Neusiok Trail, but I'm sad to be the bearer of the news that it is likely that the northern 40% of it (with the greatest lengths of boardwalk and also the most boggy non-boardwalk sections) won't be a part of the new MST route, which is scheduled to be announced in August 2014. The problem is that the former MST route (shown in black on the map below) crossed the Neuse River via the Cherry Branch - Minnesott Ferry and then proceeded west all on country roads past New Bern, Kinston, Wilson, and on to Raleigh. The new MST route (shown in green and red - red for off-road trails) swings much farther south, with several interesting off-road trail sections and a lot of public land where more off-road trail is possible. 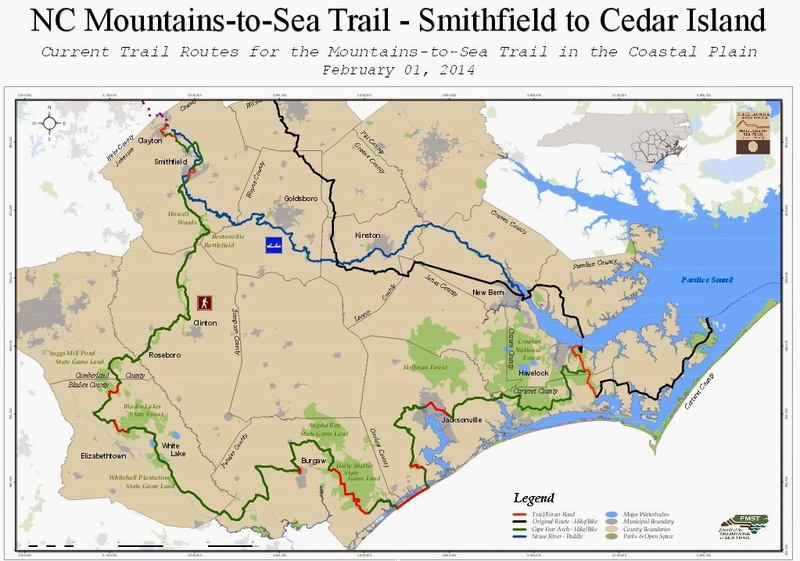 This new route follows the ecologically sensitive and diverse Cape Fear Arch through or near Havelock, Newport, Jacksonville, Surf City, Burgaw, Clinton, Smithfield, and Clayton before reaching Raleigh. What I'm going to report on today is the result of two days of hiking and scouting the part of the Neusiok Trail that is likely to be on the new MST, as well as the approaches to it from either end. Day one started out mild and springlike but turned bitter cold as a cold front with brisk breezes dropped the temperature twenty degrees in an hour. Day two was one of those rare truly bitter cold days by coastal NC standards--the temperature never got above freezing, drizzle coated everything, and the brisk wind did not relent. But if one is dressed for the conditions, then such weather presents no problem. The photo-documentation, however, suffered because of the dreary overcast conditions. Since I'm hiking the MST from east to west, that's the order this report will follow. And since it has been my responsibility to act as a scout for this part of the MST - from the Neusiok Trail to Burgaw, NC, the report contains details about the route that may seem tedious to some. 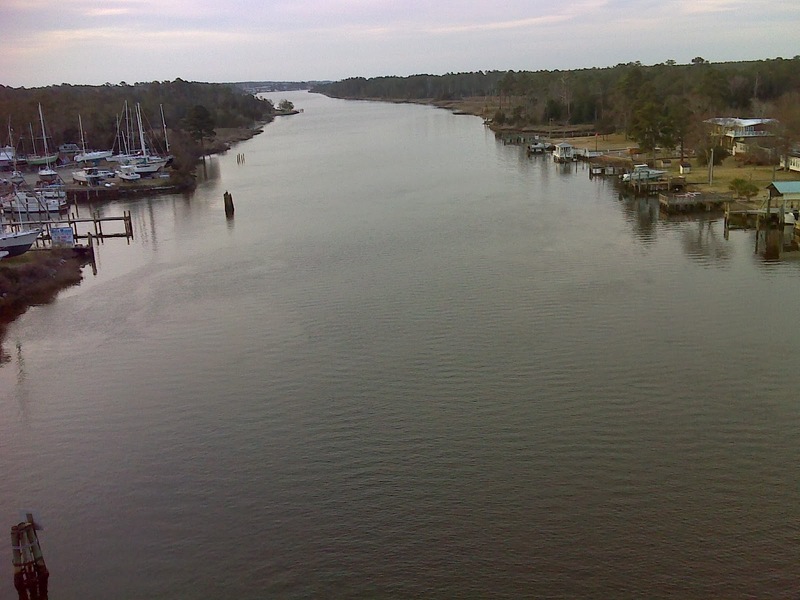 I started Day One where busy NC 101 crossed the Intracoastal Waterway at Core Creek. It's a nice high bridge with minimal shoulder and I had the pleasure (not) of having two eighteen wheelers pass one another at 55mph exactly as they were also passing me. I could almost hear the drivers shouting from their cabs: "Dude! This bridge ain't big enough for the three of us!" Of course you know which of us three would be sacrificed. Luckily I came through the experience unscathed and even managed to pause and snap this shot of Core Creek from the 'summit' of the bridge. Coming off the west side of the bridge I took the opportunity for a short shoulder-walk to serenity, picking up a wonderful little-used road called Hardesty Loop Rd. - the route of the old highway before the fancy new bridge was built. 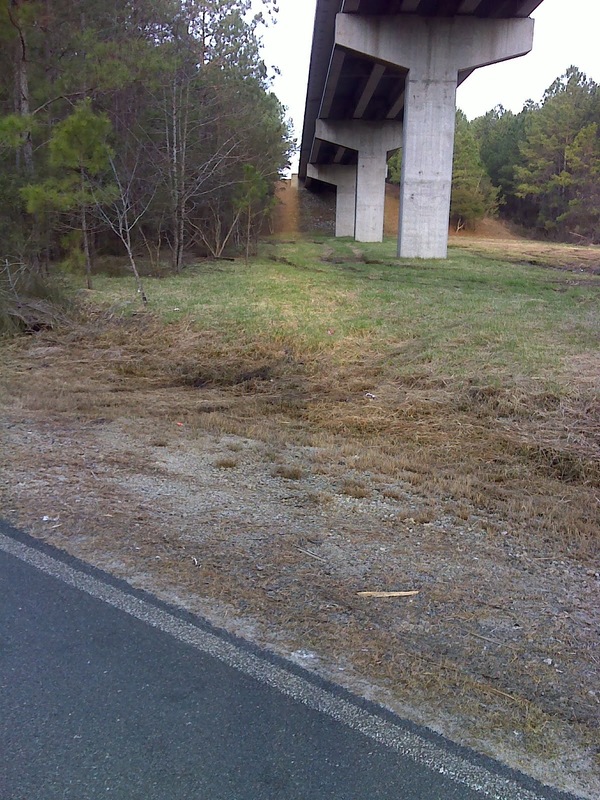 The short walk down the shoulder and along the bridge easement is easy and the grass is kept mowed by the state. 1.) The shortest route is via FS 124. This route leaves Old Wineberry after 1.1 miles and intersects the Neusiok 1.8 miles down this seldom-used woods road. 2.) Continue south on Old Wineberry another 2.6 miles to its end at Mill Creek Rd, turn left, and take up the Neusiok Trail where it crosses Mill Creek Rd. just a tenth of a mile west. That's where you'll find the sign and boardwalk shown at the top. 3.) Continue west on Mill Creek Rd. 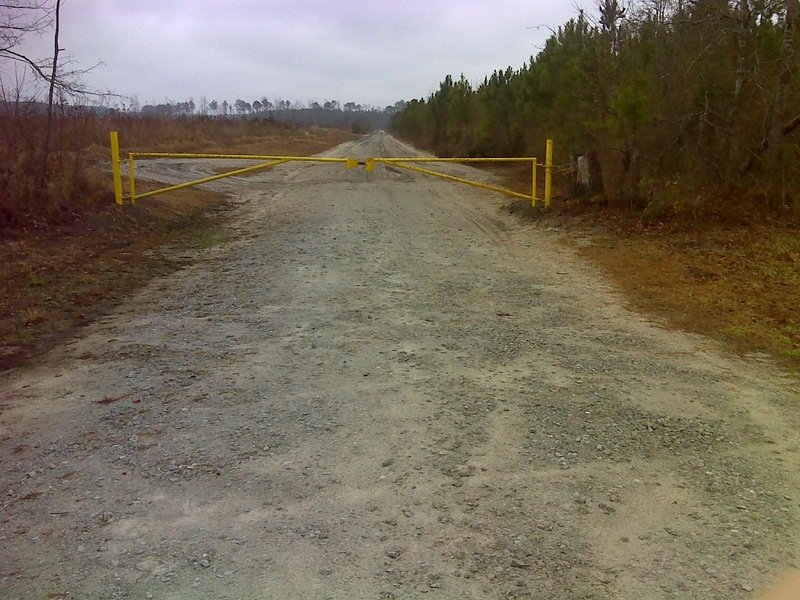 past the Neusiok Trail for just another tenth of a mile then turn left and follow the dirt road to the Neusiok Trail southern terminus trailhead and parking area at Oyster Point. 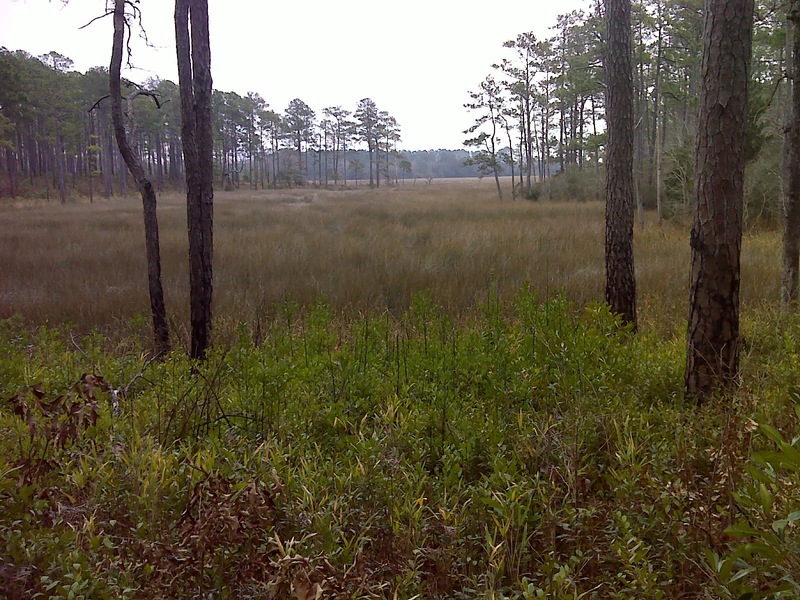 ... and of the extensive Mill Creek tidal wetlands. Continuing north on the Neusiok, you find the trail exceptionally well maintained. Somebody took the time to haul tons of gravel and build up the wet sections so that you walk along a firm mound of piled gravel. North of FS 124 there is a boggy half mile in the middle of the 1.5 miles before you emerge on another quiet woods road, FS 169. 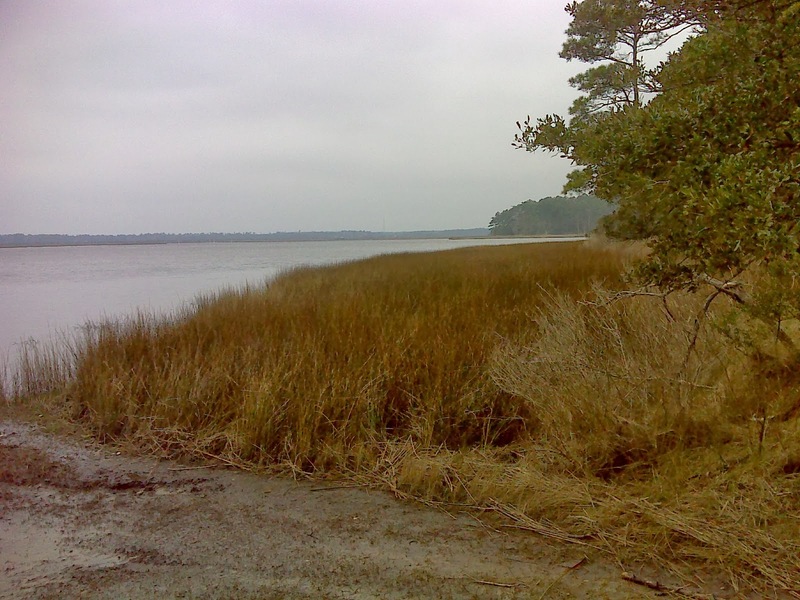 It brought back unpleasant memories of some of the boggier walking along the AT in Maine, but didn't last. I met two guys breaking camp at a primitive campsite along this section. 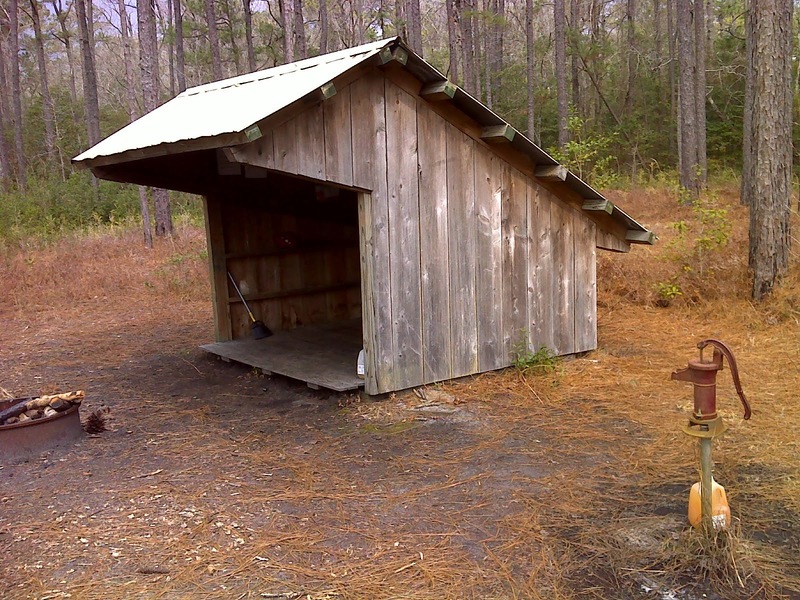 Finally the MST has to say farewell to the Neusiok Trail where there's a very short access trail to FS 147 about 0.7 miles south of the second of the Neusiok Trail's three shelters, called Dogwood Camp. I did take the detour to check out that shelter and was surprised to find myself walking through a distinctive 'island' of upland mixed forest that included all the familiar Piedmont forest species--white oak, white ash, tulip poplar, and american beech to name those I recognized. This is the only such ecosystem I've encountered so close to the coast, and surely an isolated remnant from the last ice age when sea level was substantially lower. Someone might want the MST to continue to hike the entire Neusiok Trail. If that's the case, there is a loop walk available, crossing your path once at NC 306. 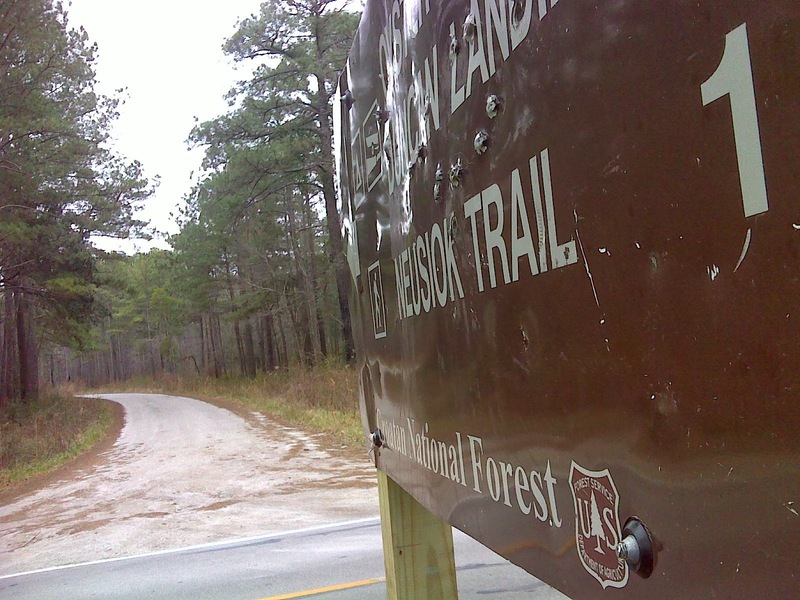 Hike the NT on north to its terminus then return south to NC 101 via Pine Cliff Rd and NC 306. I did not do this but will probably come back and hike it this summer so I can consider it part of my overall MST thru-hike. But back to today's business. Leaving the Neusiok Trail via the short access trail to FS 147, the proposed new MST route now follows that quiet winding woods road for 2.3 miles to where it comes out on NC 101. 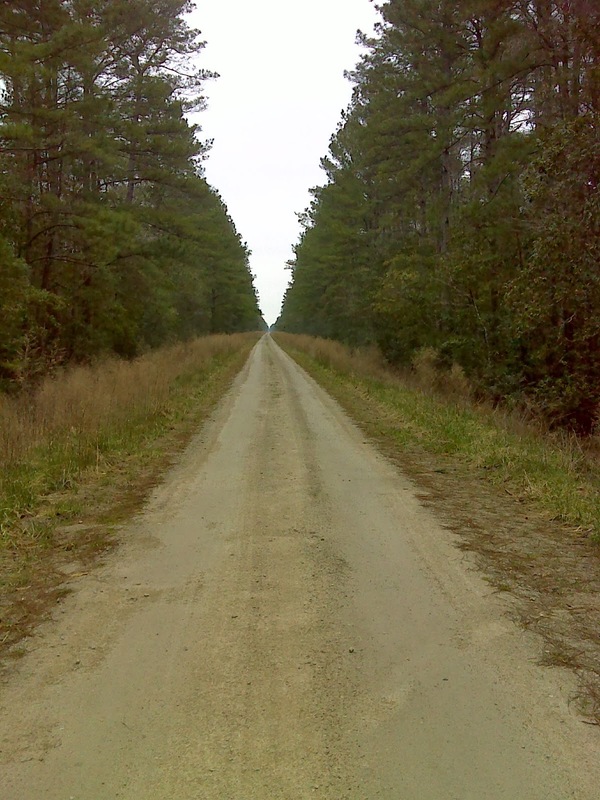 After just 0.8 miles on this road there's a possibility of plunging into the woods for about 5 miles of off-road trail through the Croatan National Forest. 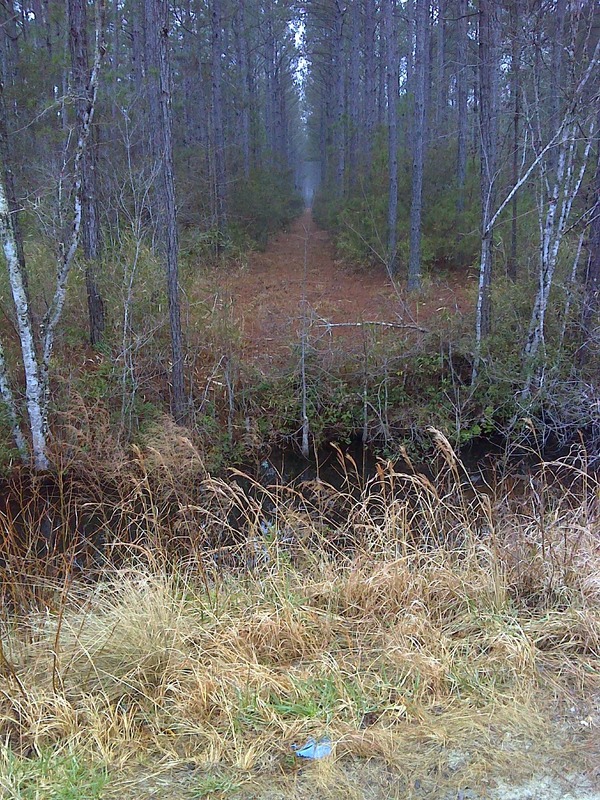 This potential future route would start near the point shown below, where Weyerhaueser forest property borders on the National Forest and Weyerhaueser maintains this boundary road through their plantation. 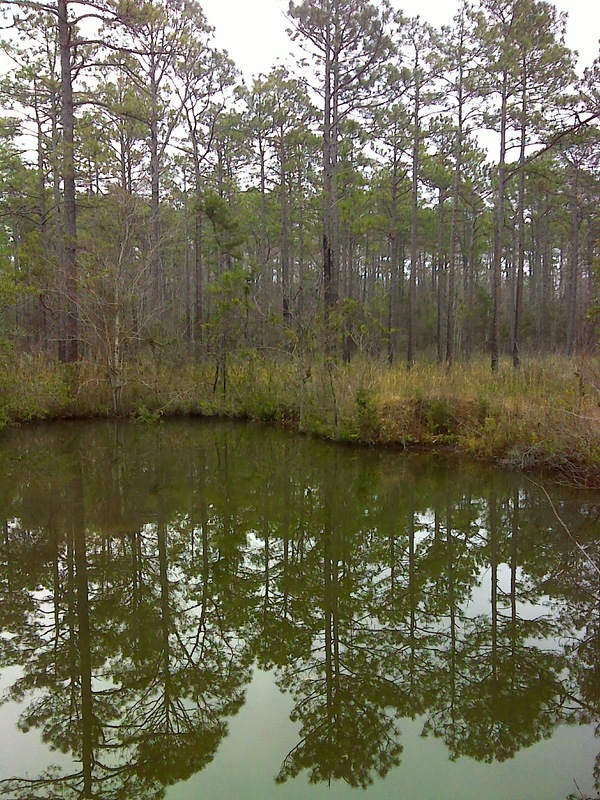 But for now the MST must follow busy NC 101 for about 3.5 miles into the town of Havelock. And that's where this report ends -- looking wistfully down a private road into the off-limits road system of the vast Weyerhaueser property as the traffic whizzes by just inches from my frazzled frame.